Among the growing number of juice bars and poke bowl spots, a decidedly unique restaurant has opened in Orange County. 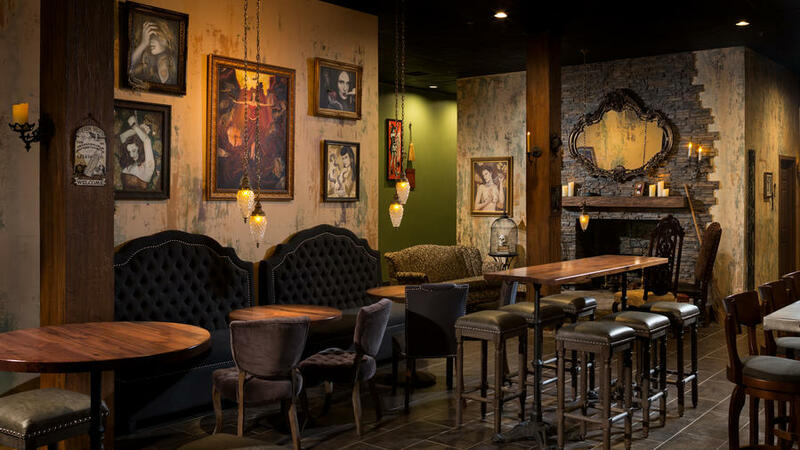 The Cauldron Spirits and Brews, a witch-themed gastropub, may be an anomaly to the rest of the Southern California dining scene, but it seems a fitting addition to Buena Park, the small town that is home to theme park Knott’s Berry Farm and only a short drive from Disneyland. While owner and Executive Chef Lara Hanneman is a Wiccan herself, the true inspiration for the spooky theme comes from her background of theater production design and her 23-year career as designer and Creative Director at Knott’s Berry Farm. She left the role to follow her dream of owning her own restaurant, where she continues to create magical experiences for visitors. “I love making immersive atmospheres for people, and I also love entertaining and cooking,” explains Hanneman, who designed and decorated the space herself. She’s also built a menu inspired by her love of French cooking, with comfort food and elevated bar bites like escargot (a rarity in Buena Park), croque monsieur sliders, and beef bourguignon. Since opening at the end of January, The Cauldron has welcomed diners of all ages, locals and tourists alike, looking for a different kind of dining experience. For Hanneman, the little details are important. The expansive-yet-cozy dining room is bedecked with eerie touches like magic potions, a bubbling cauldron, witchy portraits, and even a gothic-inspired secret room, hidden behind a bookshelf and reservable for groups.